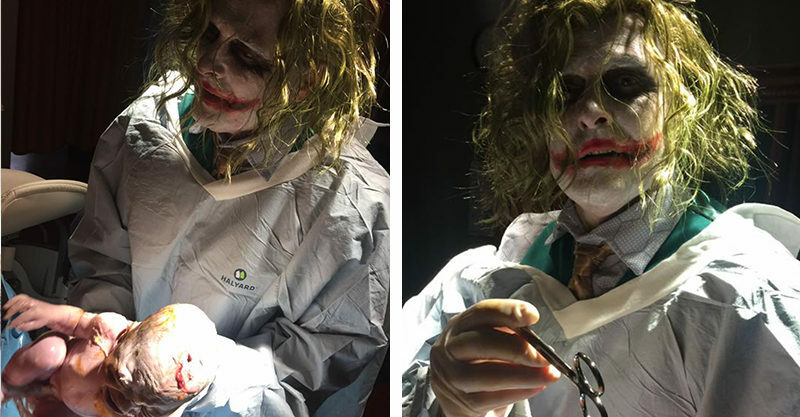 When this mum went into labour a wee bit earlier than expected – on Halloween – her doctor arrived to check on her, dressed as Batman character The Joker. Brittany Selph’s bub was due on 4 November, but baby Oaklyn decided she’d much rather make her appearance on 31 October, instead. So, off Brittany and her husband Justin popped to Tennessee’s Henry County Medical Centre and the doctor was called, quick smart. Little did the Selphs know, they were in the for a total treat, it being Halloween and all. Dr Locus arrived in full The Joker regalia, much to the expectant parents’ delight. And let’s face it, the purple suit and face full of very committed make-up is the unique delivery room surprise MOST mums didn’t know they needed! Here she is, all Beautiful and healthy!!! Welcome, Oaklyn Saige Selph!!! When it was determined that the baby was at least a few hours away, Dr Locus said he’d pop home for a bit, finish dealing with the neighbourhood Trick or Treaters and then change his clothes and come back for the delivery. Justin and Brittany, keen to have a truly unique delivery, urged him not to change. They were thrilled when he returned, still Joker-ed up. While to the untrained eye, this whole state of affairs might seem a little confronting, Brittany said her doctor’s excellent costume actually helped to relieve her pain. Baby Oaklyn was born safe and sound, and apparently totally unperturbed at the idea of being delivered by a Batman villain. Huge congratulations to the Selph family!